In September most robins will have finished their annual moult. Unlike human hair, birds’ feathers are ‘dead’ once they have emerged, and cannot grow to repair damage from sunlight or abrasion from hard surfaces. 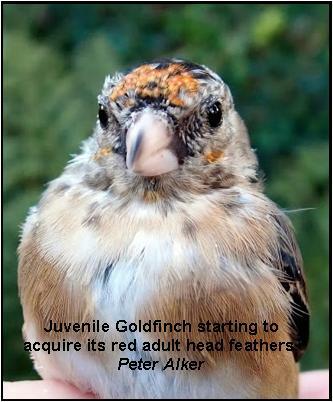 So most adults replace every feather on their body after breeding, and this year’s juveniles also moult their breast feathers to acquire the full badge of adult plumage. But this is when trouble starts in the robin community, as both males and females are territorial throughout the year. 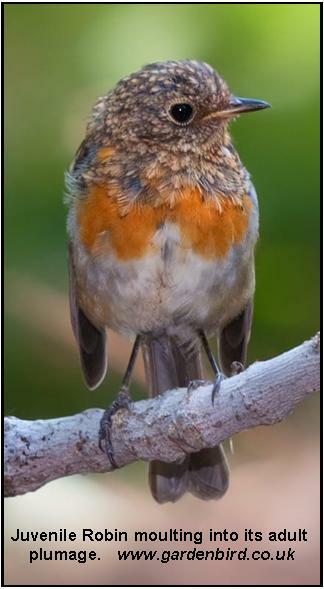 So, resplendent in their new feathers, all robins will be making the ticking sound that lets others know they are there, and the dominant birds will puff out their chests to intimidate those further down the pecking order – often dive-bombing them to drive them out of the territory. Another bird acquiring a red face as part of its adult plumage is the goldfinch. When so much of our native wildlife is in decline, this bird is a good news story. No longer a relatively scarce garden bird, its population has more than doubled in the last twenty years and flocks, or ‘charms’ to use their collective noun, can be heard almost anywhere there are trees – in towns, in the countryside or in gardens. The reasons for the increase are likely to be a combination of warmer winters, more ‘bird friendly’ land management that leaves weedy strips along farm field edges and, especially, garden bird feeders. Once nyger seed (from a tropical thistle) was introduced to gardens it attracted the goldfinches whose needle-pointed beaks are adapted to extracting the tiny seeds from thistles and teasels. The birds then discovered sunflower hearts, since when there has been no stopping them. This year has been a good nesting season for them too, enabling them to produce two or three broods. A nestling from a garden nest was brought in – alive - by a neighbour’s cat on August 18th, evidence that goldfinches and other species are benefiting from our changing climate. This is supported by findings from the British Trust for Ornithology’s Nest Record Scheme, which has data on nesting dates and productivity dating back to 1937! With this secure scientific base, DEFRA recently extended the ban on farmland hedge-cutting by a month, to the end of August, to avoid destruction of active nests. 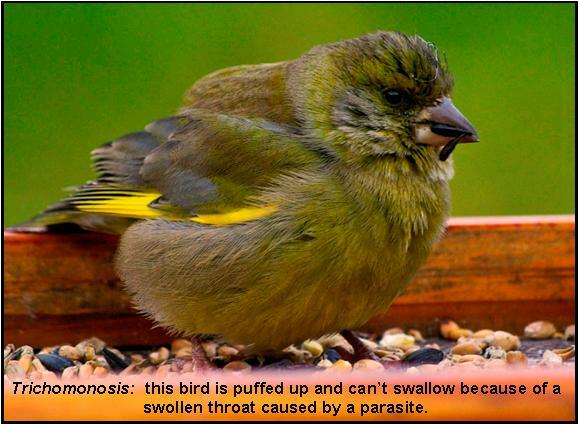 Sadly, I have also seen two birds recently in my garden showing signs of the disease trichomonosis (caused by a parasite that infects their throat so that they can’t eat). So I will be stopping feeding for a couple of weeks to allow the birds to disperse – there is plenty of food available in the hedgerows at the moment – and giving the birdfeeders and bird baths a thorough clean and sterilisation as the disease is passed on through their saliva and faeces. Other garden wildlife, such as frogs, hedgehogs and, even, grass snakes, are vulnerable to a range of diseases too. You can find out more about these from the Garden Wildlife Health initiative based at London Zoo. If you report sightings of sick animals (or are prepared to send in a dead animal for postmortem examination) it helps track animal diseases which can infect domestic animals and humans too.